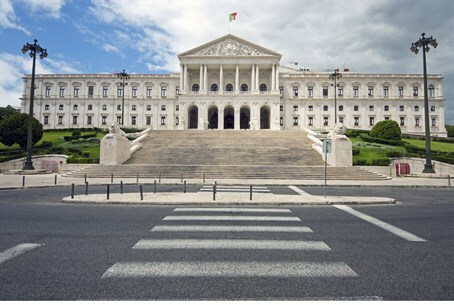 Portugal's parliament adopts a resolution calling on the government to recognize "Palestine", following a number of similar votes in Europe. Portugal's parliament on Friday adopted a resolution calling on the government to recognize the Palestinian state, following a growing number of similar votes around Europe. Parliament's motion, filed jointly by the ruling center-right majority and the opposition Socialist party, proposed "recognizing, in coordination with the European Union, the state of Palestine as independent and sovereign," according to AFP. However, Portugal's Foreign Minister Rui Machete said after the vote the government "will choose the moment best suited" to recognize the Palestinian state. He added, however, that the government was "sensitive to parliament's call," that "Israelis and Palestinians live together on a long-term basis in a peaceful way." Portuguese lawmakers who backed the measure believe "only talks can guarantee security and peace in the region." Initiatives like Portugal's form part of a trend in Europe towards recognition, until recently seen as the goal of negotiations, but now seen as a means of exerting pressure on Israel to re-launch the moribund peace process. Before Portugal, France was the last country to carry out such a move, as its upper house voted Thursday to urge its government to recognize “Palestine”. The French move came hard on the heels of a similar motion in the Irish parliament on Wednesday. British lawmakers voted overwhelmingly on October 13 in favor of a non-binding motion to "recognize the state of Palestine"; Sweden announced on October 30 it officially recognized the state of "Palestine"; and several weeks ago, Spanish lawmakers adopted a motion calling on the government to recognize a Palestinian state. A similar vote is planned in Belgium, where legislators are working on a resolution to recognize a Palestinian state, though the government said last week any timing to proceed will depend on European Union action. The French Senate vote drew a swift and angry response from Israel, which said it "hinders the possibility to advance towards peace and sends a wrong message to the Palestinians, who do not wish to negotiate." The Palestinian Authority is seeking to achieve statehood in Gaza and Judea and Samaria, with eastern Jerusalem as the capital. With little progress on reaching a settlement, they have been lobbying foreign powers for international recognition. The Palestinian Authority estimates that 135 countries have now recognized “Palestine” as a state, although that number is disputed. In addition, the PA is currently carrying out a vast international campaign and wants to submit to the UN Security Council a text demanding the end of “the Israeli occupation” in November 2016.